At Jay-Lan Lawn Care, we know that an impressive yard is more than just lush, green grass — it’s a product of many natural parts growing together to create a beautiful landscape. This includes other natural pieces like bushes and trees. The Jay-Lan team is dedicated to keeping each of these components as healthy and thriving as possible, which also means staying informed of any pest or other threats that appear in our area. The above insect may be a brilliantly beautiful shade of green, but the effects it can have on your Ash trees can be devastating. 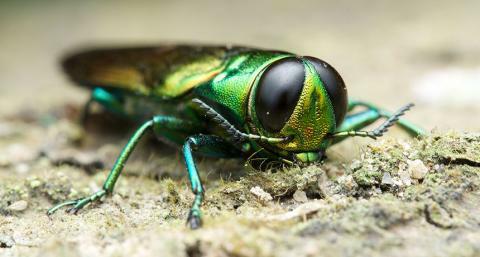 First-sighted in Detroit, MI in 2002, the Emerald Ash Borer has been wreaking havoc on the North American Ash tree population. As its reach has spread further and further west over the years, the need for an Emerald Ash Borer preventative treatment has suddenly become quite urgent, due to a 2017 sighting in Sioux Falls. Since this sighting, an effort to remove affected ash trees and administer preventative treatment on others has been implemented through a city government-approved budgetary process. While the adult versions of this beetle simply nibble on the foliage of your ash trees, the larvae upon hatching burrow into the tree, feeding in the phloem, the tissue that carries food throughout the tree. This impedes the ash tree’s ability to transport necessary nutrients and water,ultimately killing the tree. 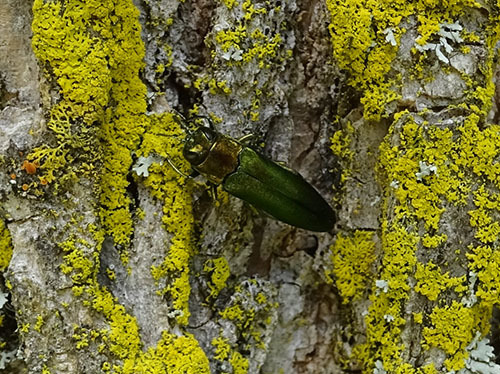 According to the Emerald Ash Borer Information Network, this beetle has devastated “hundreds of millions of ash trees in North America.” Infested areas can require quarantines and even fines in order to protect the surrounding ash tree populations. Because an infestation can happen quickly and overwhelmingly, it’s important to approach Emerald Ash Borers proactively. A simple, seasonal treatment can keep your ash trees pest-free and healthy. Luckily, Jay-Lan Lawn Care is happy to provide its Siouxland lawn care services customers with a safe and effective Emerald Ash Borer preventative treatment. So long as your green, white, and black ash trees have not been affected by the borer, our Emerald Ash Borer preventative treatment has proven to be effective. If a sighting of this pest has been confirmed within 20 miles of your home, it is highly-recommended to take advantage of this treatment. In order to determine a treatment plan, we begin with an evaluation of your ash trees and the value they add to you and your property. If a tree is found to be infected, we’ll see just how badly the infestation has spread, and help you decide whether or not a successful application of the Emerald Ash Borer preventative treatment is possible. If not, we’ll advise you to remove the tree and dispose of the wood in a manner that protects the other ash trees in your area. If your trees are good candidates for treatment, Jay-Lan can provide a seasonal treatment (applied in the spring or the fall) designed to help maintain the overall health and improve the already high value of ash trees. Administered to the tree via soil drench application, the pesticide is absorbed into the tree’s vascular system, spreading the treatment to even the tallest branches. Please call us today for a consultation and fee estimate. An Emerald Ash Borer preventative treatment from Jay-Lan Lawn Care is a simple, safe way to protect your valuable ash trees and keep them thriving for years to come. Contact us for a consultation and free estimate.